In the book, Captain Jack’s Mystery Log, there are some friends on the island with the Newfoundlander Rabbit. Included with this storyline are Uncle Stinky, a skunk who plays banjo, Anthony Ant, and Nurse Maria, a Monarch Butterfly. 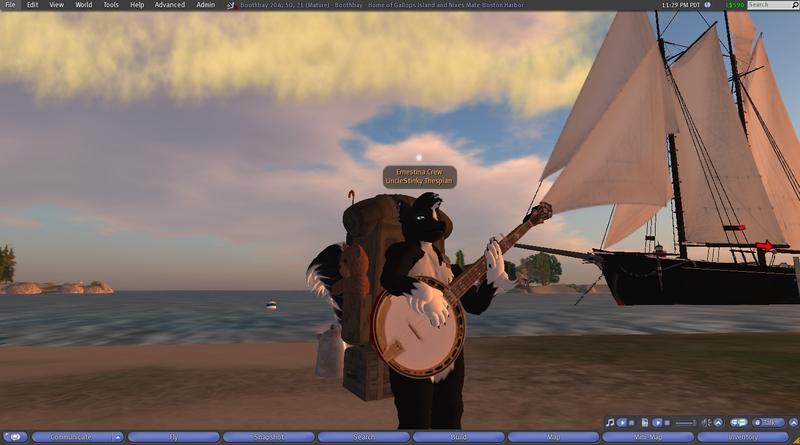 a movie of Uncle Stinky on the Beach playing banjo can be found at this link. 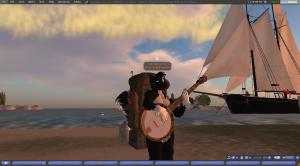 Following the trip, I had a chance to work up some new details in the SecondLife™ version of Gallops’ Island. Here is just a quick glimpse of what is added during my last visit – note the closer-to-real pier and the gazebo! Follow up to this will be a custom riprap sculpty which better approximates the rough-hewn granite blocks surrounding Gallops’ Island today. 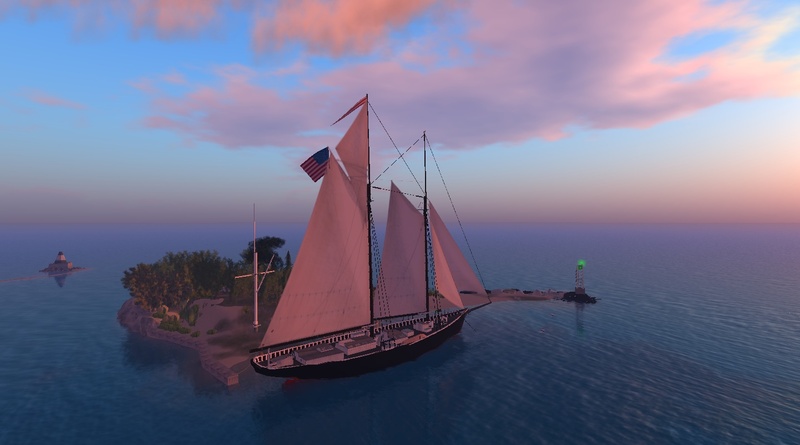 Well the Ernestina Project is going well – after visiting the Boston Harbor Islands, it was decided to work some on the islands themselves in the Second Life setting. Here are some pics of the Islands from the trip to boston with Mister Wind! 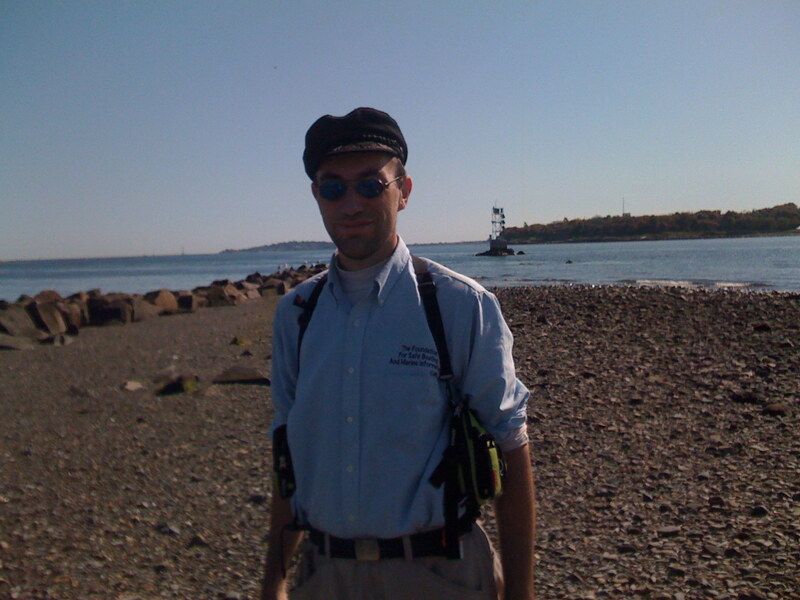 Here are, in no particular order, about 250 shots from all the reels of the trip to Gallops’ and Georges’ Islands. Hello, hope this finds you well! 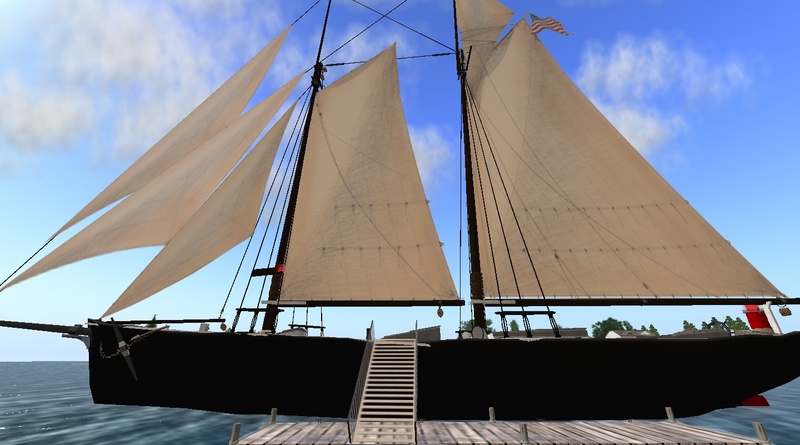 The Ernestina Project has been moving along well and some results are pictured below. 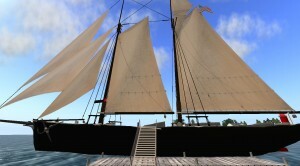 Still to come are scripted sheet tending, anchor lowering and raising, helming and climbing animations. Also to come is the fully scripted boat menu-driven console, with settings for all points of sail and generally priming for a sailable version.